Saturday, January 22: Yesterday, Mani tried to convince me to hire him for more tours today, but I made the excuse that I could only afford the package I already bought through the hotel. I didn’t want to spend another whole day having to try to decipher his English! So today, I just get the driver, who is not particularly loquacious. Relief! Today we go further afield, quite a long haul. 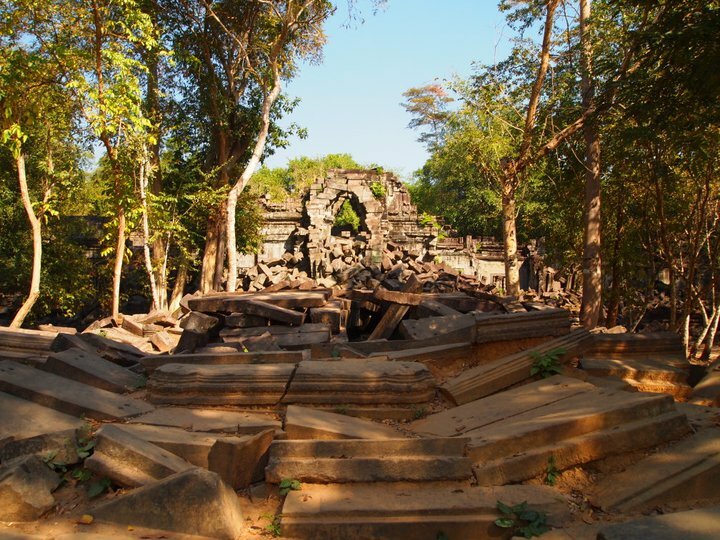 Beng Mealea is 65 km northeast of Siem Reap over a sealed toll road. We cruise by the poorest of the poor, me sitting in the back seat staring out the window at houses on stilts in the middle of nowhere. Through the window I see the same, same, same. 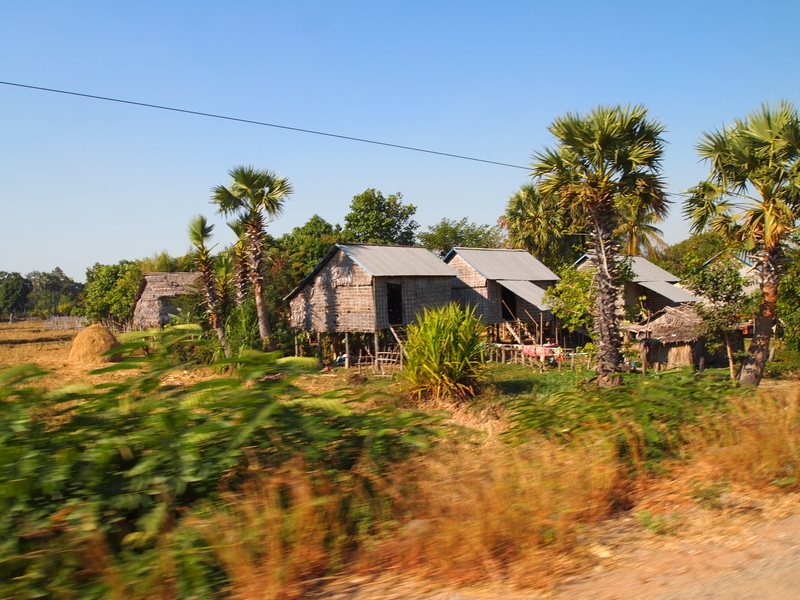 Palm trees and palm-leaf and betel-leaf houses on stilts with whole lives being lived underneath the homes, in their shadows. 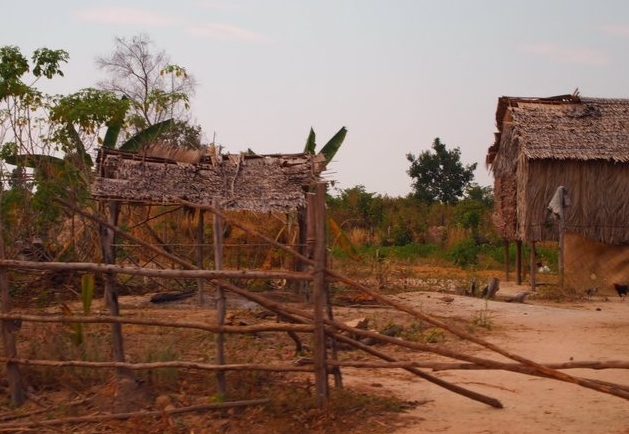 In the wet season, the occupants stay inside, but in the hot season, they sleep in hammocks under the houses. 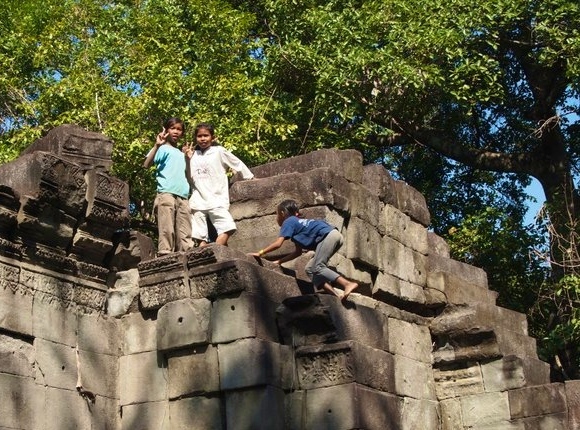 Dirty brown children run amok in mismatched clothes, mothers stir food over fires, fathers work on engines on these dirt floors, swept to a hard surface. Colorful clothes hang on lines under the houses, or in the sun. Huge bales of hay sit under the shade of chestnut trees. 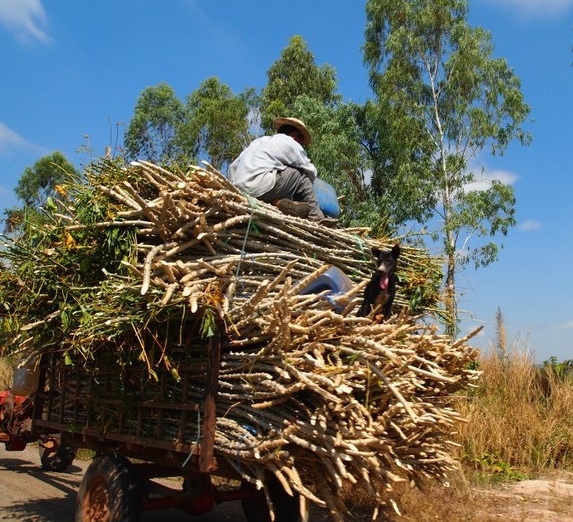 I ask the driver how these people make a living and he says most of them grow rice. 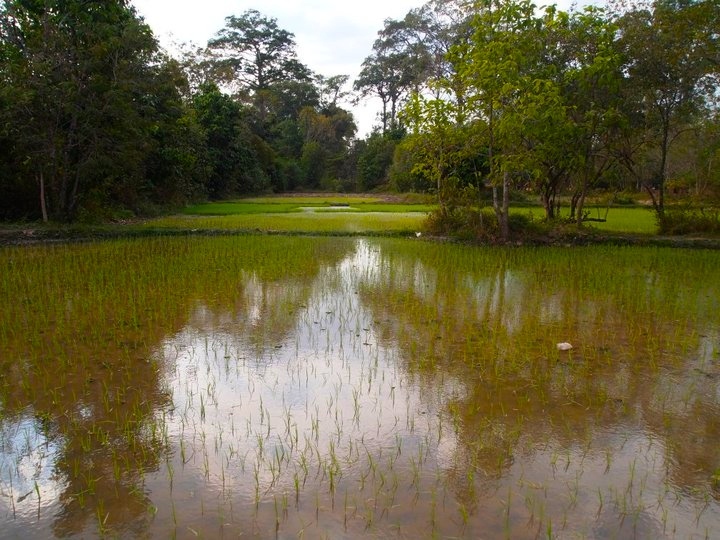 There’s not enough water out here to grow vegetables. He says the rich people have mango farms or cashew nut farms. These are not the rich people. 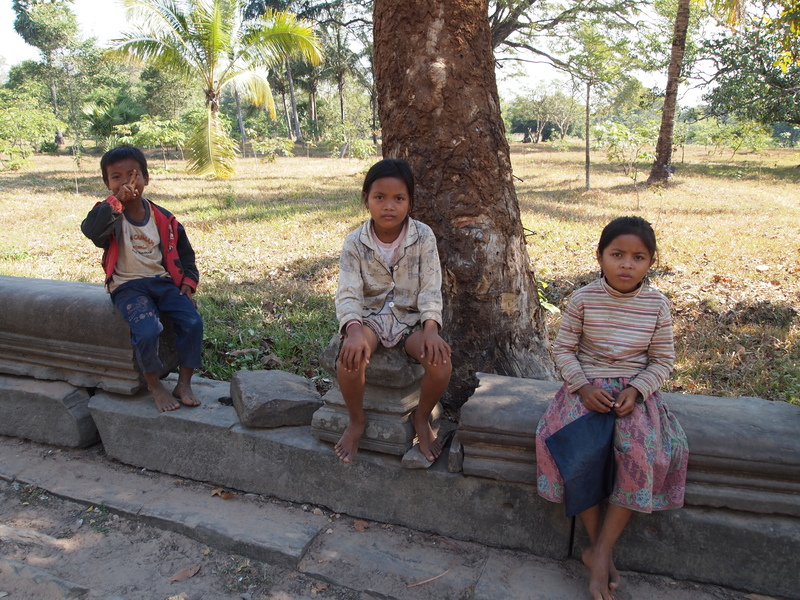 We arrive at Beng Mealea, and as I walk down the long path to the temple, I come across some filthy but adorable Cambodian children sitting on a fence. I ask if I can take their picture and then they ask for a dollar, but the smallest thing I have is a $10. I’m sorry, I say. 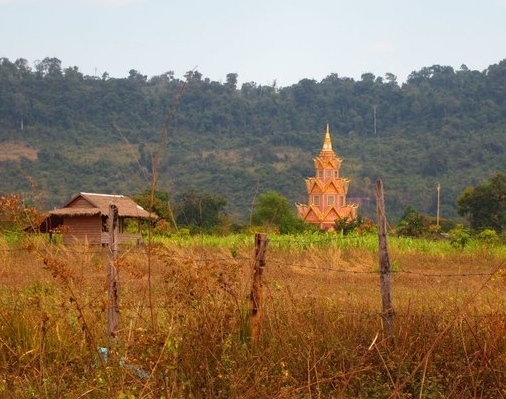 As I walk further, I notice a Cambodian guy with long greasy hair following me, stopping when I stop, moving when I move. When I arrive at the temple, he hovers around me, waiting for something. 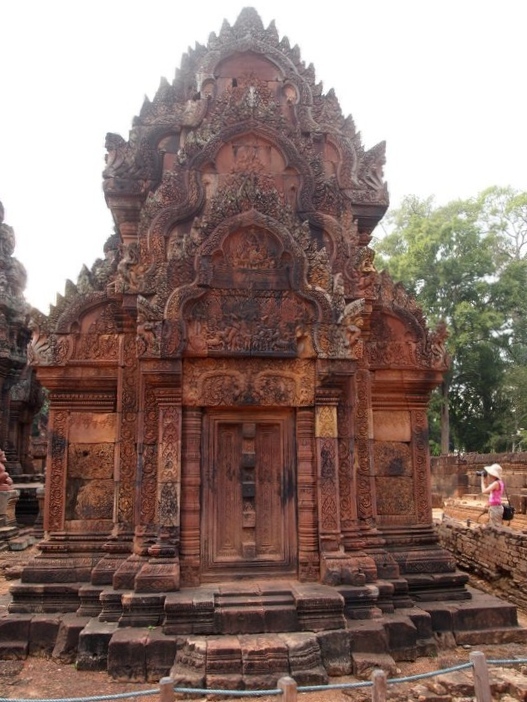 Then I notice almost every foreigner has a Cambodian, either adult or child, orbiting them, pointing out odd things about the temple. I realize they are all trying to give little tours to the tourists, certainly expecting a tip in return. I don’t like the looks of this particular guy ~ he’s so sleazy looking. His hair is so filthy it must be full of lice. I tell him to please not follow me! I don’t want a tour! 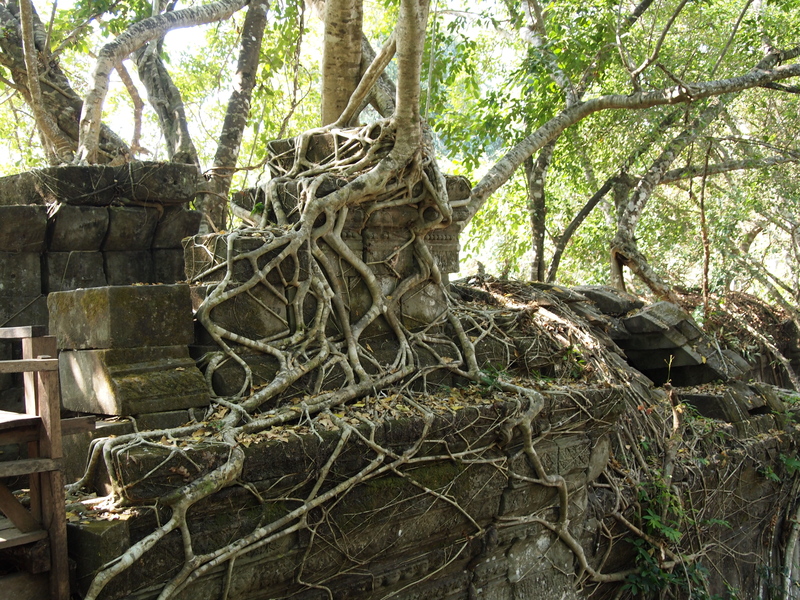 Here nature runs rampant even more than it did at Ta Prohm. 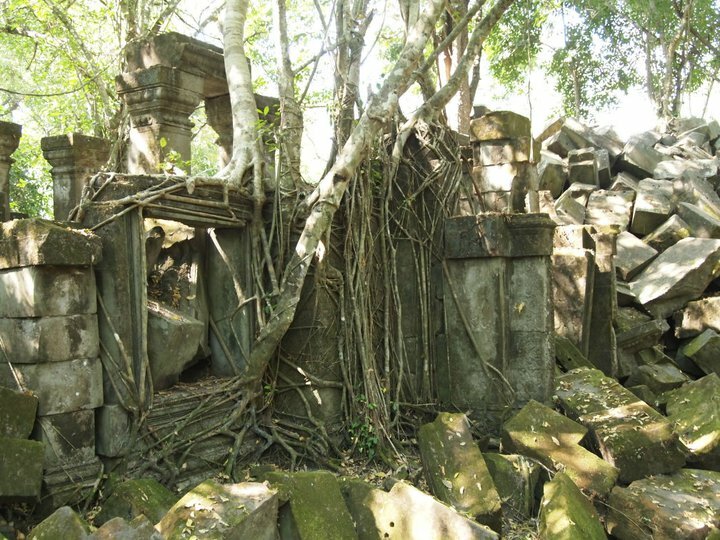 Trees and bushes and vines strangle every standing wall, every fallen stone. 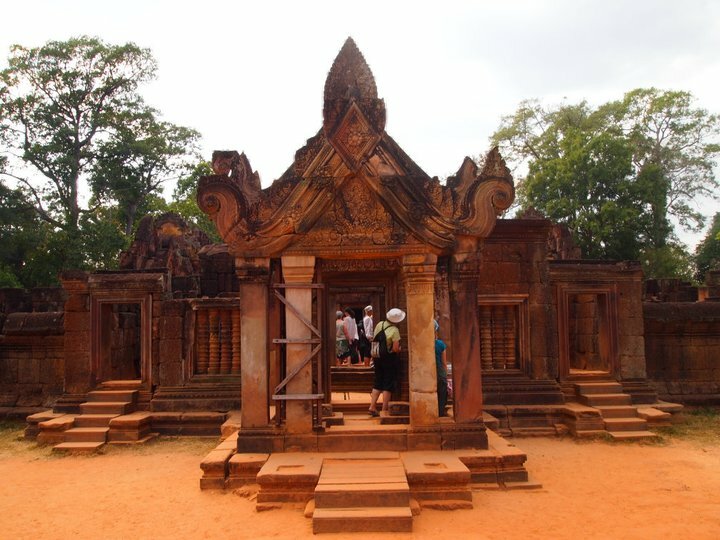 This temple was built to the same floor plan as Angkor Wat by Suryavarman II, but the floor plan is virtually unrecognizable. It’s an incoherent mess. 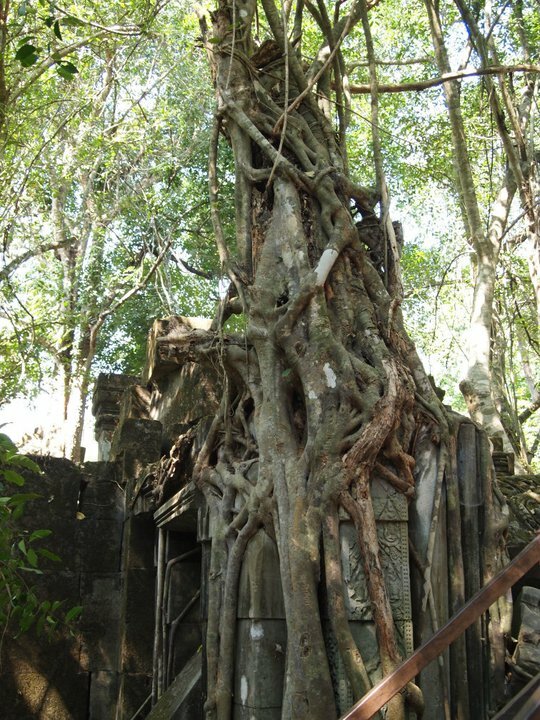 Ta Prohm at least retains some semblance of its former self. 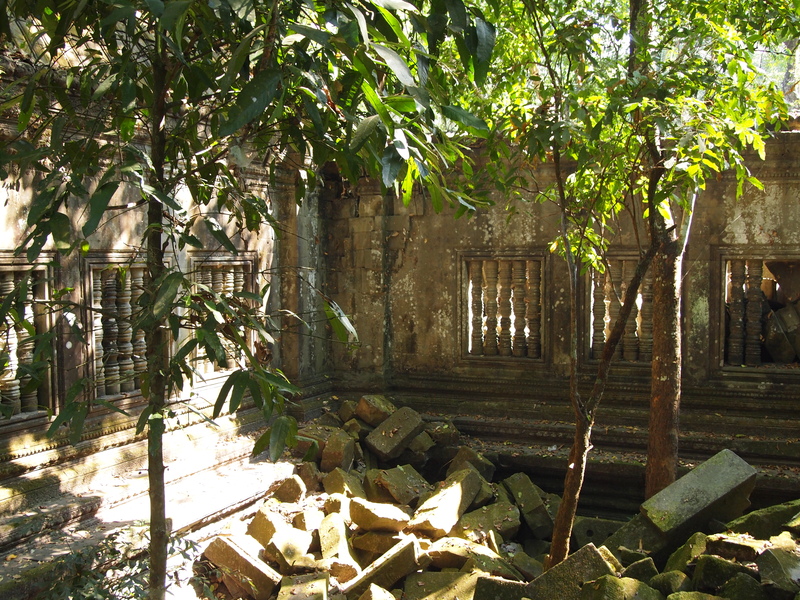 This is just a jumble of fallen stones and decaying walls. 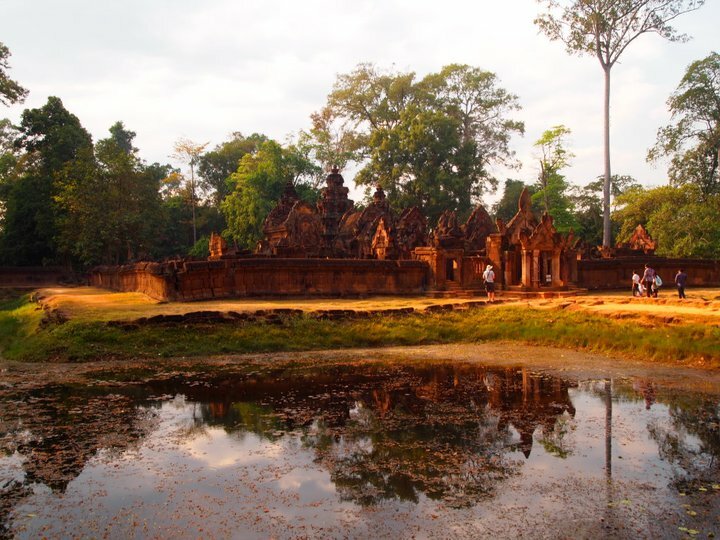 Though the Lonely Planet describes it as “Angkor’s ultimate Indiana Jones experience,” I think it’s too much. 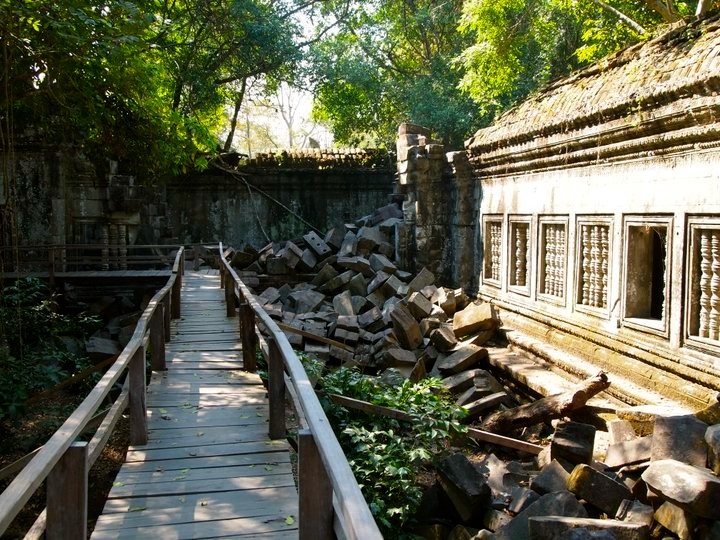 I don’t know why they don’t just bulldoze it all down. At the very least maybe someone could try to make some sense out of it all. Leaving the temple, I meet a young guy named Chris from San Francisco. 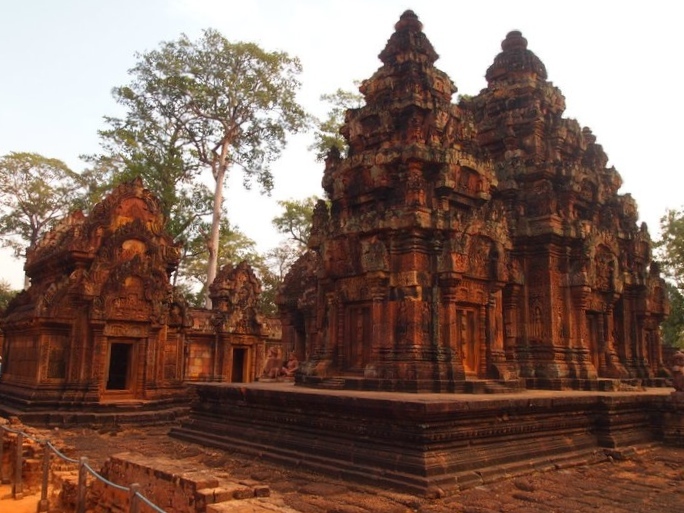 He has already spent 1 month in Vietnam, 1 month in Cambodia, and 1 month in Thailand. The last month of his trip will be a whirlwind through Hong Kong, the Philippines, and Singapore. He just graduated from college with a major in finance. He started applying for jobs, but then his father told him: “Money will always come and go, but the memories you’ll have traveling with a friend will last forever.” He asks about me and I tell him and he says it’s really great what I’m doing. He said most people your age just dream about doing something so adventurous! They never DO it! I find my driver in a cafe chatting with other drivers. We get in the car again for the longest leg of the drive, down a red dirt road ~ we’re in a Toyota Camry, remember! 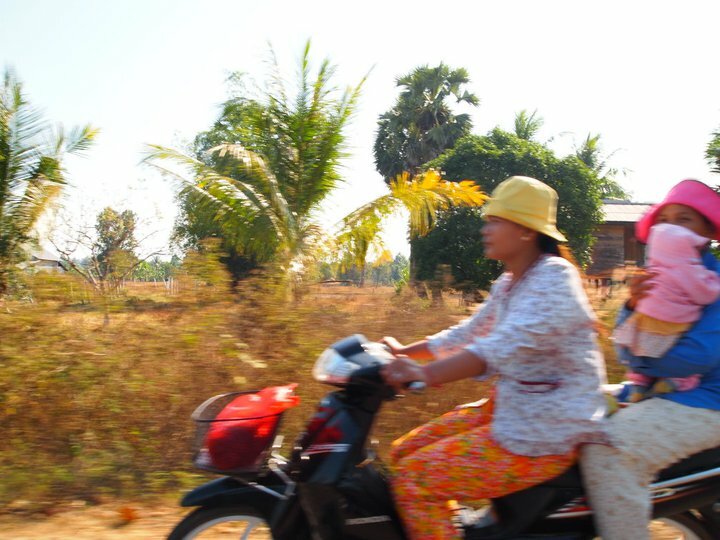 ~ grinding and bumping along slowly and painfully across gravel and potholes and uneven road. 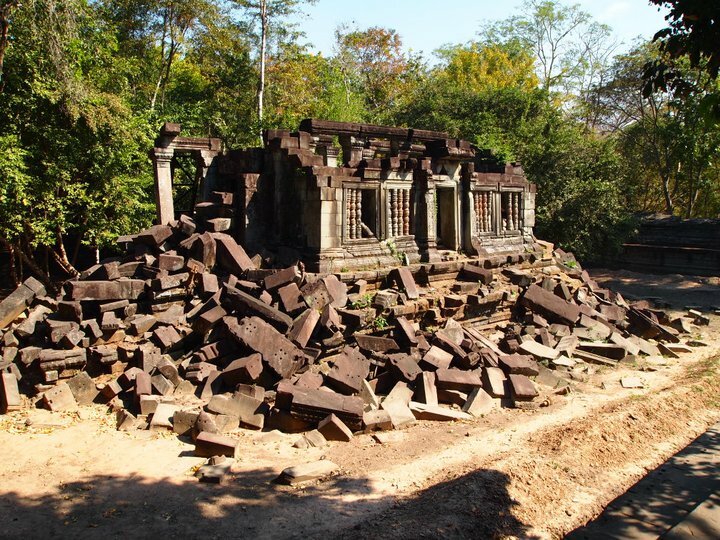 It’s a disaster, and though our destination of Kbal Spean is only 50 km northeast of Siem Reap (shouldn’t that be around 15 km from Beng Mealea, which is 65 km northeast of Siem Reap? ), it takes at least an hour and a half on this road. I keep staring out the window at the nothingness around. There are long stretches where there aren’t even any houses. I’m glad I trust my driver, because if we were on a road like this in Mexico or many other places, I’d be worried about a gang of bandits attacking us. 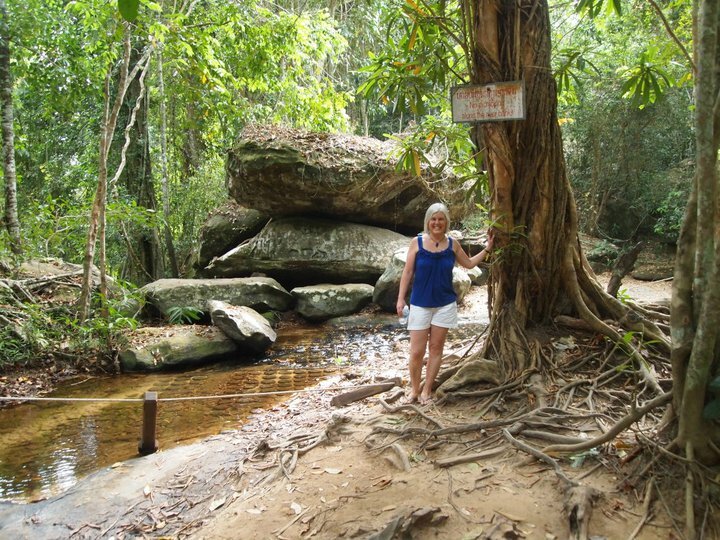 We arrive finally at Kbal Spean, known in English as the “River of a Thousand Lingas.” At the entrance, we stop to eat lunch first. The driver points out one cafe in a long line of outdoor restaurants and tells me I should eat there. I look at the menu and decide I don’t like what they have, so I move to a place next door which is quite crowded, always a good sign. The woman in the first cafe yells, Your driver said you should eat here!! I say, No! I want to eat next door! The driver than follows me sheepishly next door and gets a meal at the same restaurant as me. I think he must get some kind of kickback for bringing customers in, but I wonder why he was so insistent on the first place. Maybe he has a business deal with her but no arrangement with the restaurant I choose. Curious. 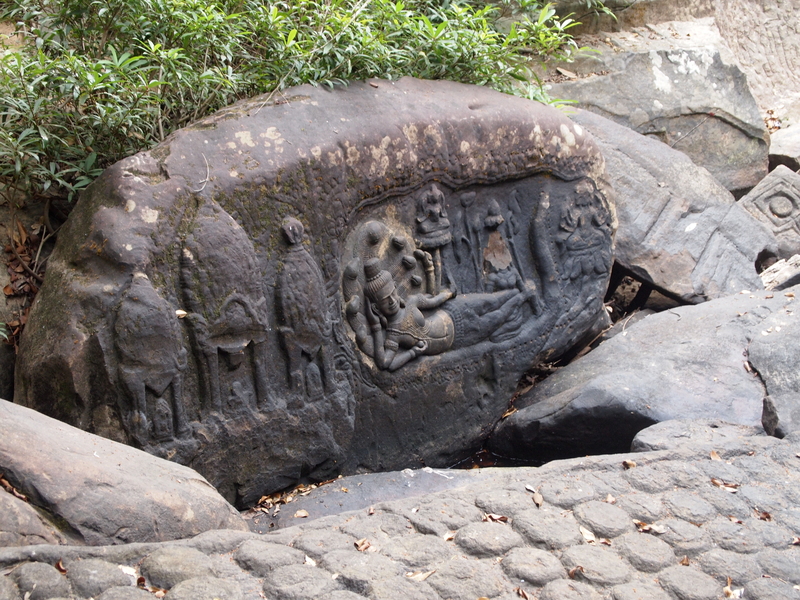 It takes 1.5 km to climb uphill to the riverbed which is carved with ancient figures. I plan to go it alone, but the driver insists on coming with me. We arrive first to a waterfall where some young foreigners are standing under the falling water, laughing and getting soaked. 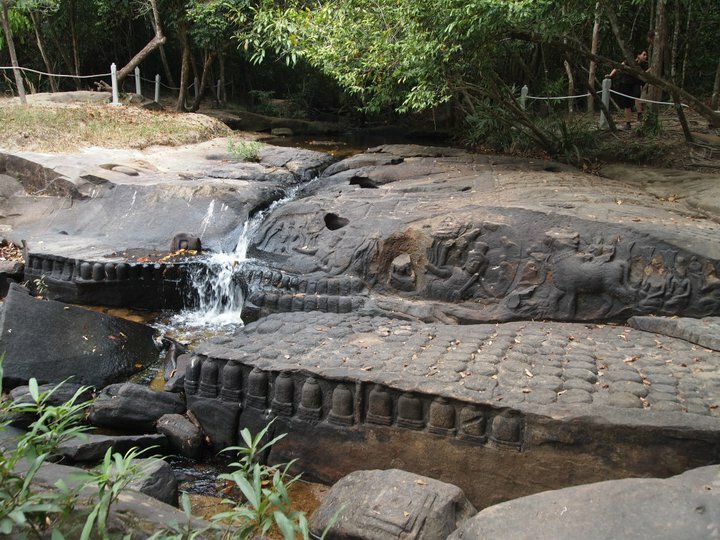 We walk up another path to the riverbed, with its famous carvings. 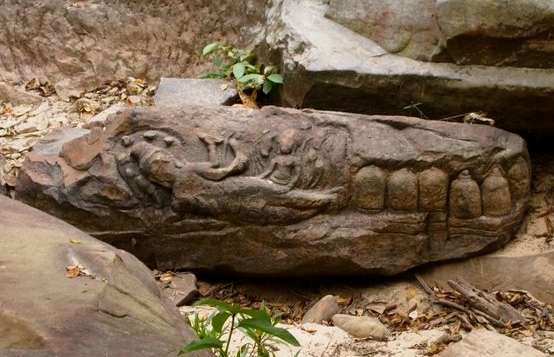 It’s amazing that someone carved these so long ago, pieces of art in the rock bed. The driver mentions how someone found someone else decapitated here in these woods. I say, What?? I remember how Richard the Australian told me that the police reports in the paper often listed decapitation crimes. I say, Who was decapitated? A local person or a tourist? He looks at me funny. 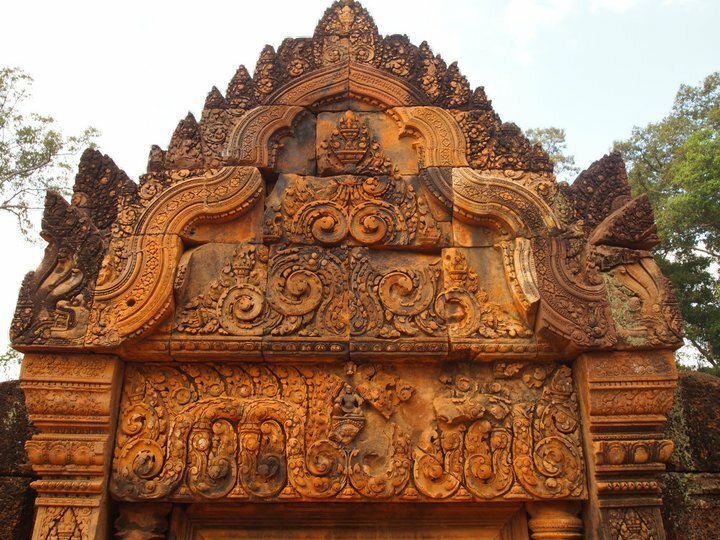 We go back and forth for some time trying to understand each other, and finally it dawns on me that he’s saying some of the CARVINGS were decapitated, much like the ones at Angkor Wat. 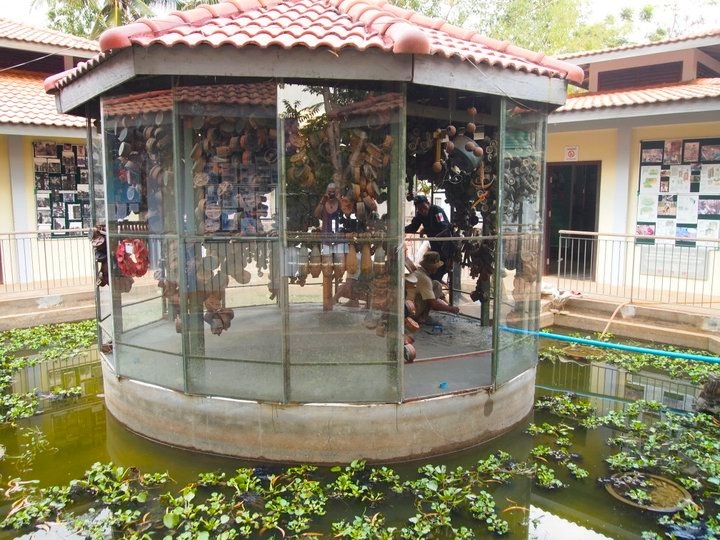 Heads chopped off and sold for a profit in some underground market. 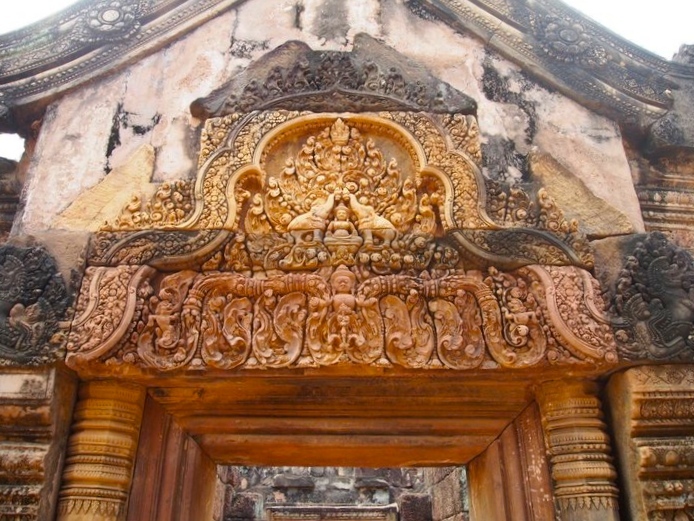 After criss-crossing the river and looking at the carvings, we start the walk back down. At this point, had I been by myself, I would have been thoroughly lost, so I’m thankful the driver insisted on coming with me! 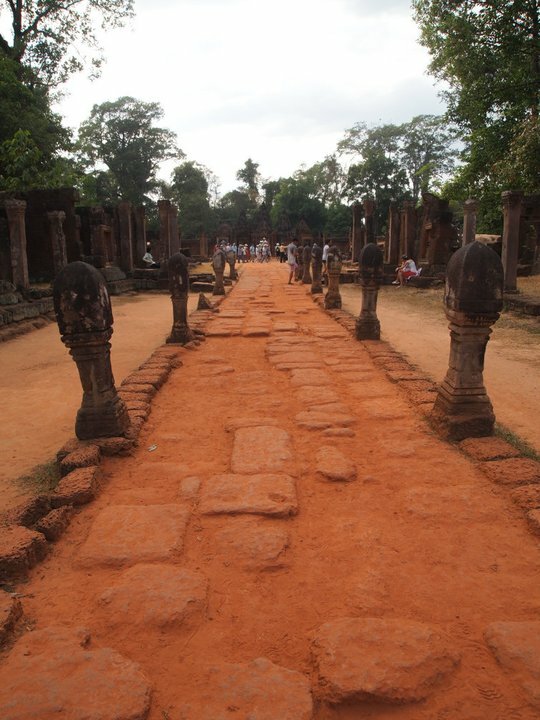 I had figured there would be crowds of people to follow, but it really is quite deserted! 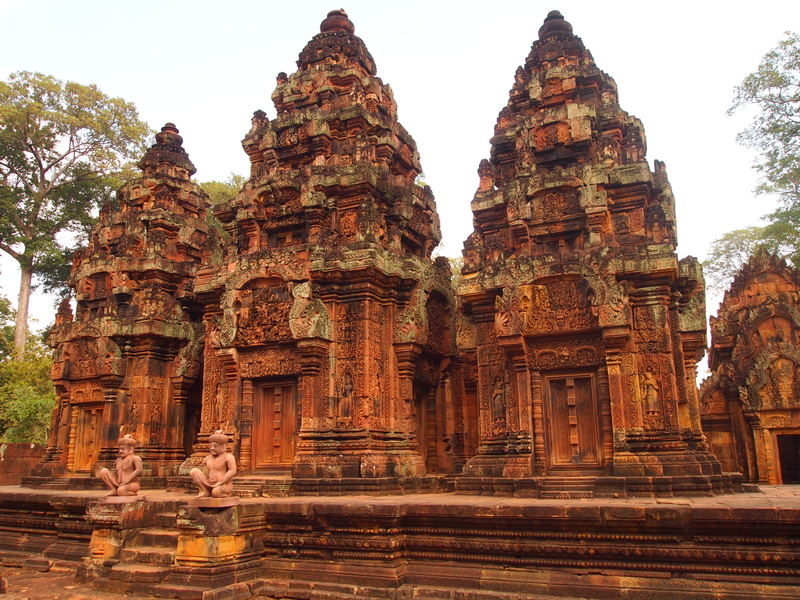 Finally, we head to the finest temple of them all, Banteay Srei. 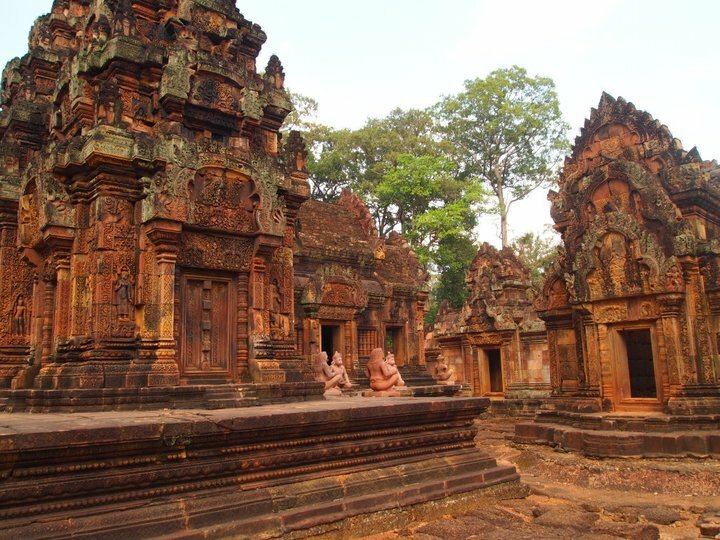 This temple is cut from stone of a pinkish color and the stone carvings are exquisitely detailed. 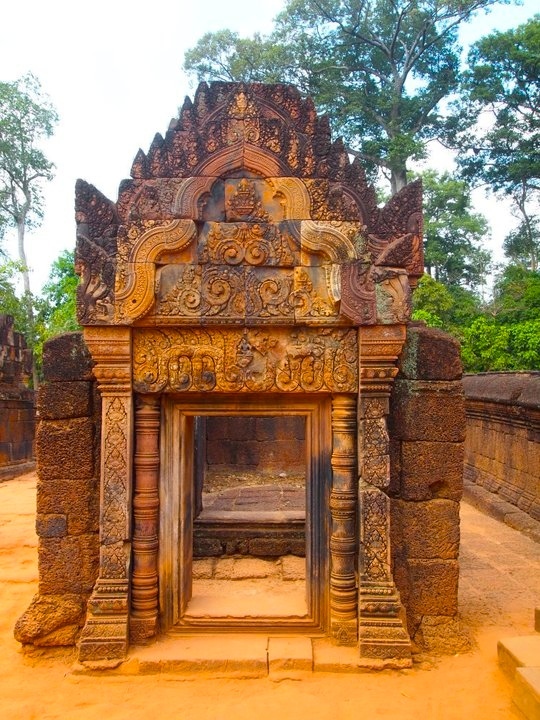 Though small, this temple is neat and orderly and quite beautiful. 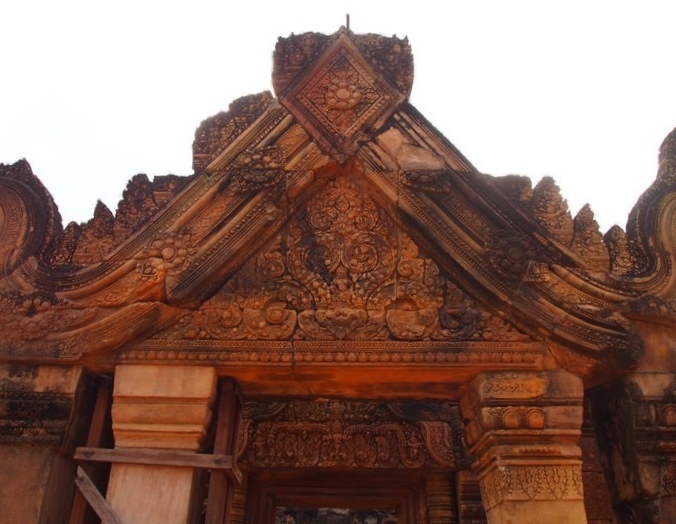 Carved monkeys sit at strategic corners of the temple, like little deformed midget kings. 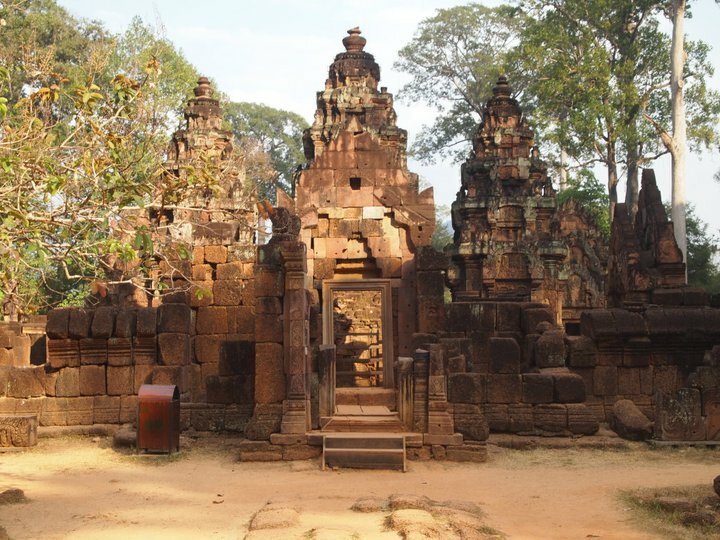 This temple was built in AD 967, commissioned not by a king but by a Brahman. 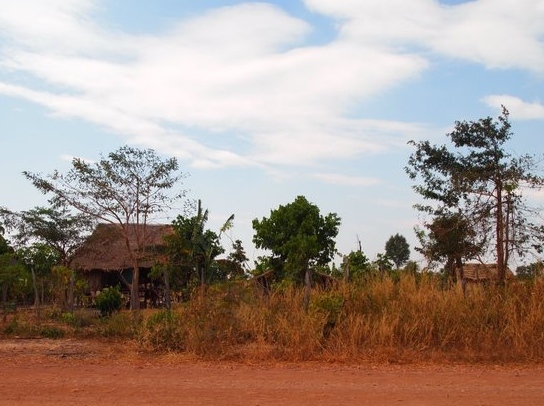 We make a quick stop at the Cambodia Landmine Museum, where the history of landmines is told, to bring awareness of the pervasive landmine problem in Cambodia. 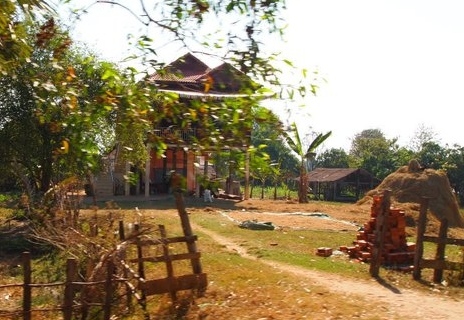 It also is a home which provides victims of landmines with education and support. 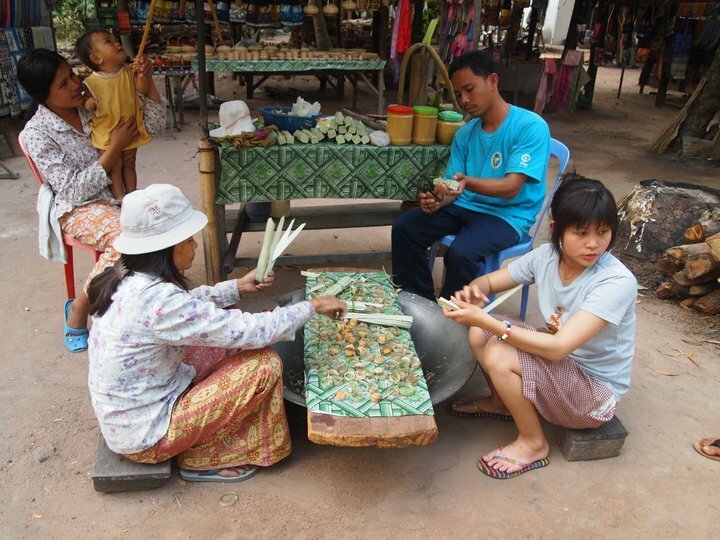 On our way back to Siem Reap, we stop along the side of the road to buy a little sugar cane. 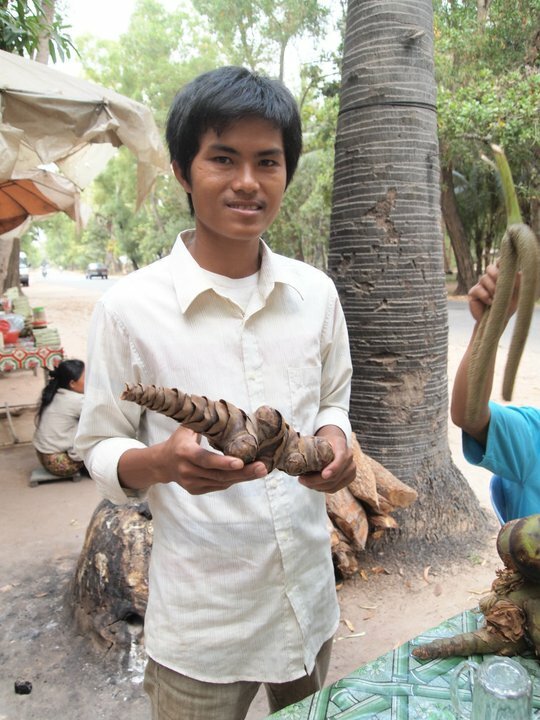 The locals are sitting along the side of the road selling it and they show me how they prepare it to eat. 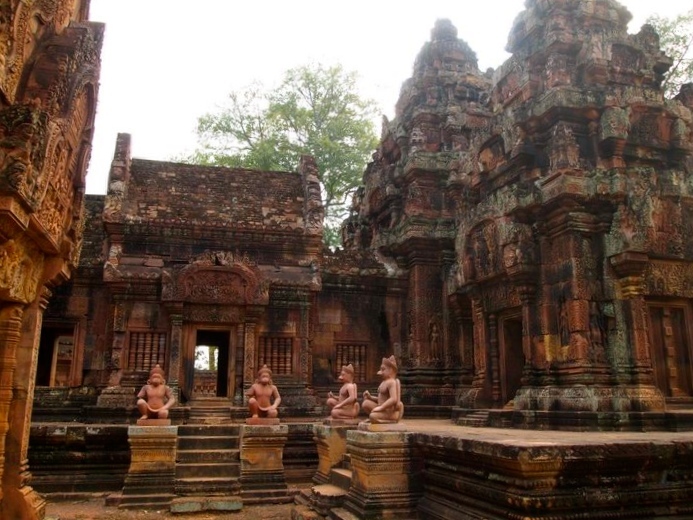 Back in Siem Reap, I put on my bathing suit and sit by the pool. I actually try to go in for the first time, but it’s freezing! So I sit by the pool and read my book and close my eyes. Later I go to a fabulous restaurant, just a several block walk down the same street as my hotel. 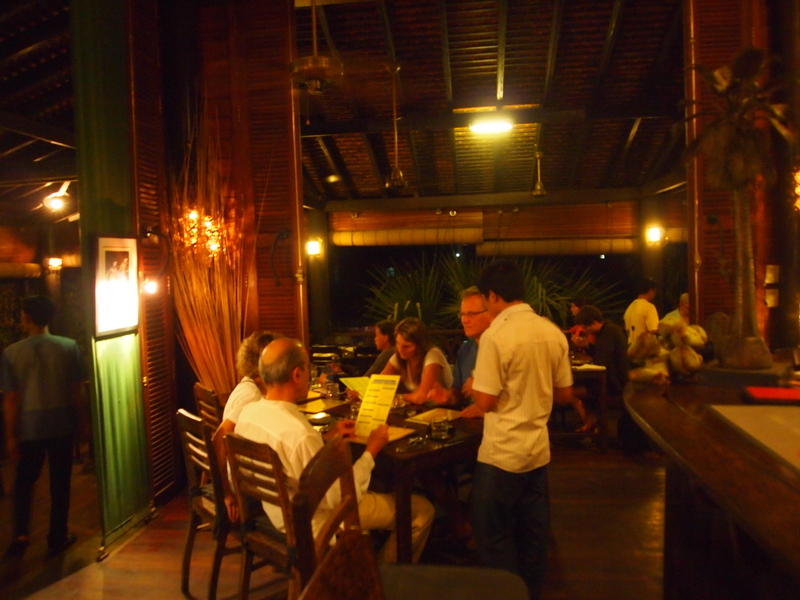 Called the Sugar Palm, it’s an open air cafe on the second floor of a house, with dark wood and a large square bar in the middle. When I go in, there are no seats so I ask if I can eat at the bar, my favorite thing to do anyway. A woman around my age seats me and we strike up a conversation. It turns out she and her husband own the restaurant. Her name is Kethana and her husband, who she introduces me to, is Bruce. He’s Australian and she’s Cambodian but speaks perfect Australian English. I order a glass of red wine and she recommends the Asian eggplant with minced pork. I’m usually not a pork eater, but this is one of the most delectable things I’ve eaten on my entire trip. While I sit at the bar, she comes to join me with her own glass of wine and we have a great conversation. She tells me about her marriage, hinting that marriage is sometimes difficult; she tells about her family and their lives straddling two continents, Australia and Asia. Later, some friends of hers come in and chat with us; they’re from West Virginia and he has a private airplane that he flies here. 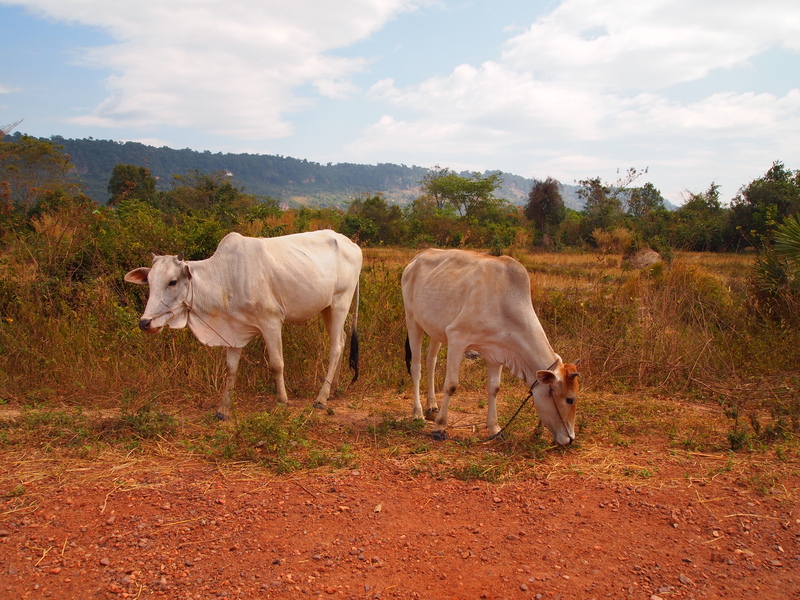 They have spent every winter in Cambodia for over 20 years. They ask me what I’m doing in my life and I tell them. I also say it’s been a lonely year in Korea, that I miss my family, especially my kids. I tell them sometimes I struggle with the dilemma of wanting to go back to my marriage, although I don’t even know if my husband would be interested. The woman becomes quite insistent; with humor in her voice, she says, “I think you should just keep going!” She then asks her husband, “I told her to just keep going, what do you think?” They both agree that I’m on a roll now and I should just keep traveling the world. 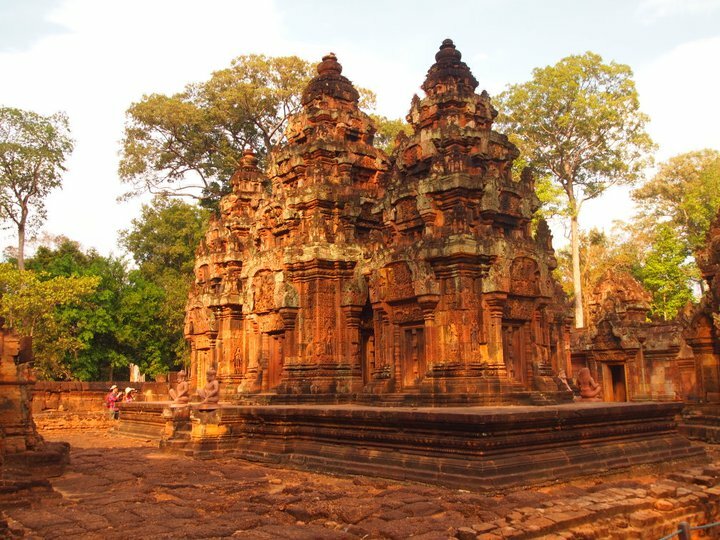 They all suggest that I should try to teach in Cambodia, that Cambodia is amazing. I can see it is amazing! I love it myself. But I still have it in my mind to teach or work in the Middle East. They all three are appalled by that. Oh my gosh, forget the Middle East! they say emphatically. Asia is so much better!! I don’t know what to say to this. I know where my heart leads me. Whether reality will take me there remains to be seen.